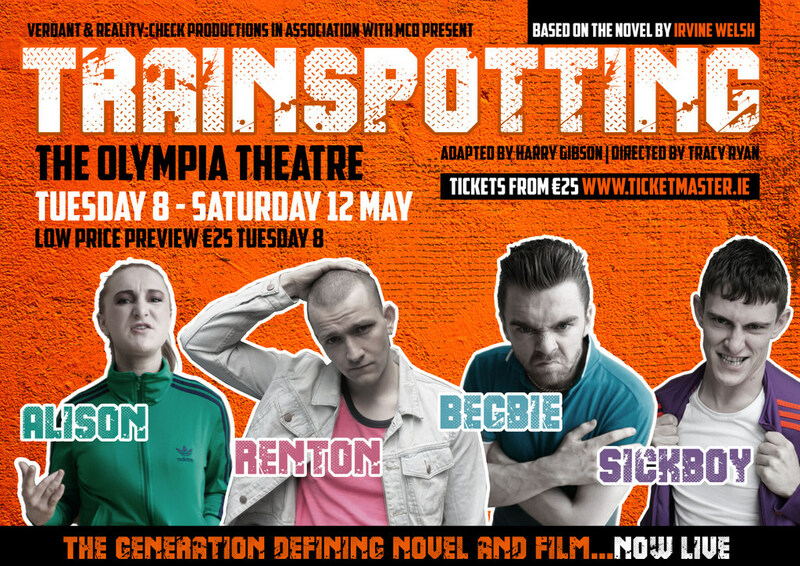 We have one pair of tickets to give away for Trainspotting at the Olympia Theare on the 08-05-18. Email your answer to nomoreworkhorse@gmail.com, mark the subject line of the mail Trainspotting Competition and include your name and day time phone number. All entrants must be over 18 and tickets are non-transferable. One entry per person only. Closing date for entries is Monday the 26th of March at 1pm. The generation defining novel & film – now live on stage! In a new major production of Harry Gibson’s adaptation of Trainspotting, Irvine Welsh’s controversial and raw depiction of a drug culture rife in Edinburgh in the 1980s, is an uncompromising work that still packs a punch today. Danny Boyle’s film adaptation and subsequent sequel T2, is testament to its continued relevance. Brought to life through a soundscape of 80s dance music, with a live DJ playing pre & post show, the edgy Scottish humour and uncompromising dialogue follows a group of friends as they struggle to survive the Edinburgh heroin scene. Directed by Tracy Ryan & starring Shane O’Regan, Fionn Foley, Meg Healy & Lorcan Strain.